I think I tried to stuff too many jobs into this month and that's why my life has been so hectic for the past four weeks! Still, I think there's some benefit in providing you with an insight into what it takes to create an original artwork, printed on canvas, using photography as my paint brush. My latest creation, titled "Constructed Sydney" is the basis for this blog post. "Constructed Sydney" is an original artwork designed and signed by photographer artist, Markham Lane. Copyright 2010 Markham Lane photography. All Rights Reserved. It all started with a brief from one of my favourite clients, to fill a space in the boardroom of his new office building, located at Sydney's Circular Quay. While the brief was simple enough; "Something with the Sydney Habour Bridge, in black and white, that matches the dimensions of the light-space in the room next door", producing something original, that I would be proud to sign my name on, filled me with dred. It's the same every time ...and I think it's got something to do with my own high standards for creating art. Having spent years travelling the world, studying the greatest artists of all time, I want my work to somehow live up to my own ideal of what is "great". I want my work to be different, to be (at least) a little original. To have the Markham twist, telling a story, big picture, little picture. He loved the idea of "photography as the paintbrush", which suits me at the moment given how my creative talents are in this zone. 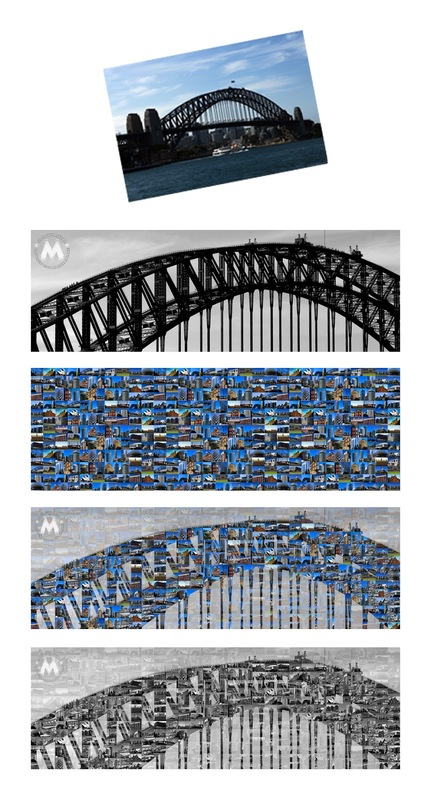 I came up with an overall concept - historic architectural Sydney, embedded within the structure of the Harbour Bridge - to which he agreed to take a chance on me and commissioned the artwork. While I tried to share with him the process to develop, he offered the only caveat - that he didn't really want to be involved in the artistic development on the final piece, "Not wanting to step on your creative license" was the way he put it. Well, that's a dream situation for an artist, so I entered into the process with gusto. 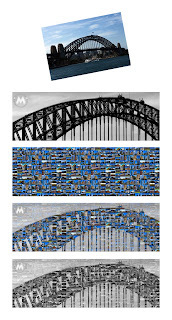 The first step was to collect an image of the Sydney Harbour Bridge, along with all the images of "historic architectural Sydney". You may not be able to see it here, but on the final artwork (210cm x 70cm) the entire canvas is covered by a title mosaic of buildings located in Sydney. Each tile is about 8cm x5cm. Some buildings were built recently, with others from as far back as the early 1800's. Two months later, I had enough images collected to build the mosaic tile. All images were originally photographed in colour on blue sky days, (during a post-drought period, a blue-sky was difficult to arrange) as I still wanted to produce a colour version of the artwork, before completing the process for my client in moving to black and white. Using Photoshop to merge image layers at high resolution made the "superMac" grind to a halt in the dying stages. Aparently the "scratch disks were full". Hell, I have no idea what that means either but there was a lot of tinkering with the computer by my awesome partner to get it working again. Three days later, and voi-la!! Original artworks, printed on canvas, using photography as the paintbrush, is the realisation of my life's passion. In understanding the process anatomy, you get an opportunity to come into my world, to see what my crazy "Time is Art" philosophy is about and hopefully enjoy something great to look at too. Markham Lane photography website is http://www.markhamimages.com/ and he can be contacted via his Agent, Quaetapo Media, on +61-2-9332-2028 for interested parties requiring any of his photography services.